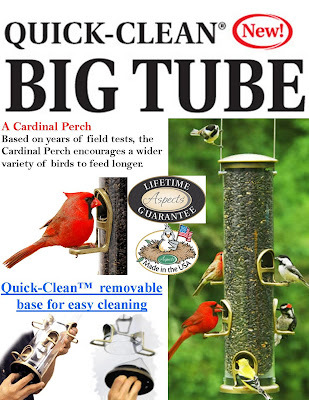 I have been anticipating the arrival of the new Quick Clean Big Tube since spring. I wasn't sure about the new design so I only ordered one to check it out. It came in last week and wow-o-wow. It's beautiful! I sold that one before I could even price it and have been waiting to write about it until we restocked. More arrived today and let me tell you about them. Aspects and Wild Birds Unlimited are both committed to helping future generations appreciate and enjoy nature by donating to programs that support wildlife conservation. Aspects has always manufactured proudly in the USA to ensure quality and strives to continue to offer new, innovative products that are backed with a Lifetime Guarantee. And let me tell you this new feeder is definitely a winner!